Mosaic Mandala Educational Puzzle is a forty four piece brightly coloured puzzle with squares, triangles, diamonds and circles. 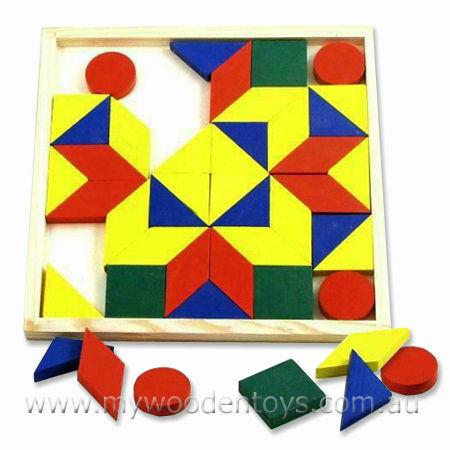 This puzzles shapes can be built up to make different things like a rockets, or houses or just pretty patterns. Making colourful patterns is a lovely aspect of this puzzle. It is a lovely, contemplative, calm activity for your busy little one. Trying to fit all the pieces back into the square base is a real challenge and kept our 5 year old busy for ages. Beautiful, simple traditional puzzle toy that will keep your little one amused making wonderful, colourful patterns. We like this because: "it is brightly coloured, a challenge and it is really fun making lovely patterns."